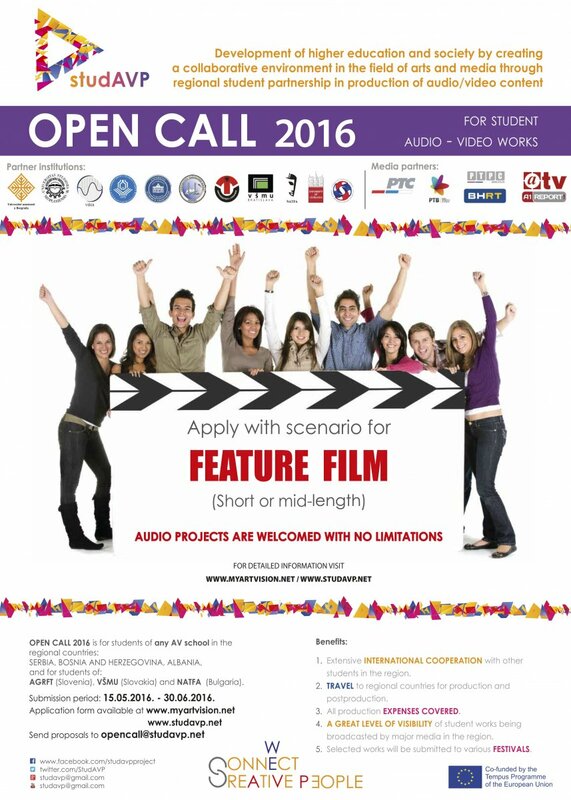 Apply with screenplay for short or mid-lentgh FEATURE MOVIE. Submition period from 15.05.2016. till 30.06.2016. Projects built around the idea of international students cooperation will have the advantage in selection. Download Application form (DOWNLOAD section). Save it to your local disc, fill in required fields and make a short description-synopsis of your proposal. 5. WHO PAYS PRODUCTION COSTS? Production cost of accepted works will be covered by StudAVP project, according to planned budget. Process of selection of subbmited proposals undergo eliminatory stages. First selection will be published on StudAVP web site no later than 15.7.2016. During summer time students will work with mentor-professor or professional, on developing the scenario, preproduction aspects.... Cooperation plan will be developed. You can appy with sinopsys and undergo selection proces for production under the StudAVP project. This will give you possibility to cooperate with other students on your proposal. 9. WHEN THE PRODUCTION WILL TAKE PLACE? Actual production will take place in period September - November 2016. Students will travel. The StudAVP will cover all students travel costs and Costs of stay. 10. HOW WILL BE FINISHED STUDENT PROJECTS PRESENTED TO THE PUBLIC? Through our Media partners who are major television and radio broadcasters in the region. Your work will be presented and broadcasted by RTS, RTV, BHRT, ATV, media. Some works will be submitted to various film or audio festivals.